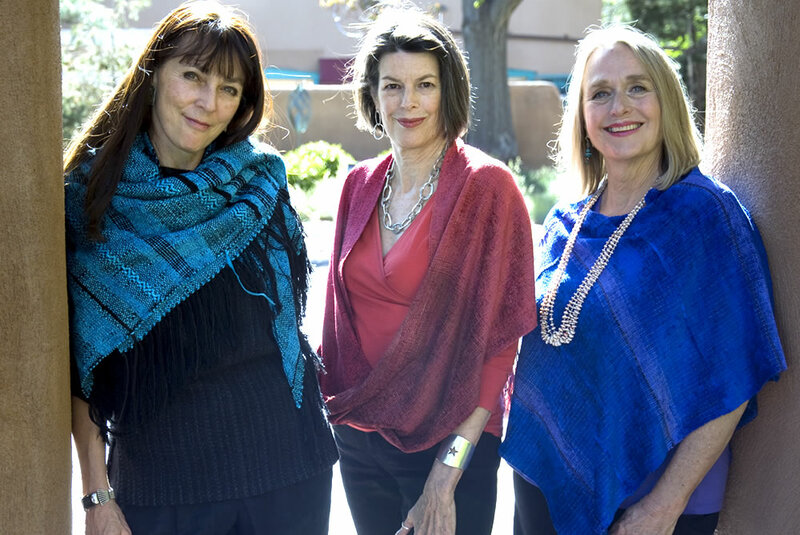 Over the last 30+ years Handwoven Originals has showcased the finest woven garments, knits, painted silk, handmade felts and original jewelry by some of New Mexico's best designers, artists and craftspeople. The store specializes in one of a kind pieces that bring together sensuous texture, beautiful color and attention to design detail. Handwoven Originals got its modest start in 1976 when J.B. (J. Boles Peña) opened the doors to her tiny weaving studio on Bull Ring Alley in Santa Fe. Louise Lechner soon joined her and they would work at their looms while tending the shop. In the summers, they staged fashion shows at the nearby Pink Adobe restaurant. Their business continued to grow and in August 1980 they moved to their current space in the Inn at Loretto. It was around this time that a third weaver, Ceil Swanson Evans, joined in the partnership. Over the years the collaboration thrived as an innovative artist-run business. They continue to produce original woven garments of the finest quality, while showcasing the unique jewelry, clothing and accessories of numerous local artists. The summer of 2013 was one of our busiest weaving summers ever, the excitement was overshadowed however by a terrible loss. Handwoven Originals partner Louise Marshall Lechner passed away in June 2013 after a lengthy battle with cancer. Her strength throughout her illness and outlook through the end continues to inspire us everyday. We continue to honor Louise's memory everyday in our weaving, knitting and all our creative pursuits. Ceil has taken up the mantle weaving "Lulu's Infinity Wrap". Amanda, Louise's daughter has the knitting bug and is putting her own spin on her mom's signature knits. Louise echos all over the shop in stripes of red here, a zigzag there. Very many of us are feeling Louise's collaborative spark in our projects.